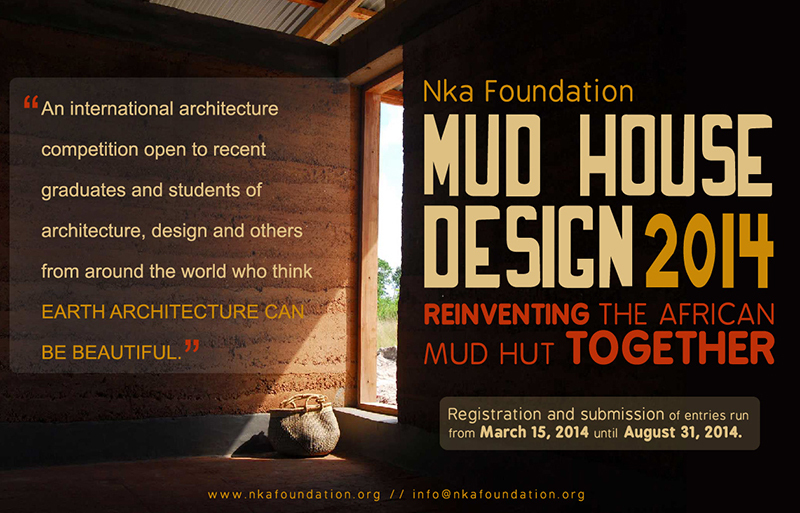 The NKA foundation has started a architectural competition to design and promote the traditional Mud Hut. What is exciting about this project is their open source approach! The challenge is to design a single-family unit of about 30 x 40 feet on a plot of 60 x 60 feet to be built by maximum use of earth and local labor in the Ashanti Region of Ghana. The client for the design is the middle-income family in the Ashanti Region. Total costs of constructing the design entry must not exceed $6,000; land value is excluded from this price point. The competition is aimed to serve as an example to the local people that mud architecture can be beautiful and durable. For example, in the Abetenim area, 98% of the homes are made of earth, however local stereotypes about buildings made of earth persist because there are several examples of mud homes that have eroded over time due to poor construction and water damage. That is why there is local stigma associated with mud architecture. The local perception is that mud buildings are only for the very poor. The NKA foundation reason that a design intervention can help generate alternatives to resolve the problem. In light of the problem, NKA foundation is running a Mud House Design Competition to encourage designers, architects and builders to use their creativity to come up with innovative designs for modest, affordable homes that can be built locally. The design should aim at creating a single family and semi-urban house type that is a place to live, a place to rest, store modest belongings, and feel safe. The first place winning entry will be built on a site in the Ashanti Region. What is the preferred construction method for the winning entries? The method to be used to construct the design concept can be cob construction, rammed earth, mud brick, cast earth (poured earth) by formwork, or any other earth construction techniques that can be easily learned by local labor. Roofing design could be of vault, fired mud roof, or corrugated zinc sheets, which is the conventional roofing materials because zinc roofing stands the heavy rainfall better. The design entry may therefore aim to accomplish a prototype, a durable mud house that promotes open source design for the continuity of building with earth under the feet for a more sustainable future. Undeniably, the competition promotes open source design, as a sustainable development model. By Open Source, we imply that the submitted designs will be available for all to appreciate, use, or improve them to generate a more practical and contemporary design solutions for the region. The long-term goal is to enable the Ghanaian population and lots of other places, to overcome the stigma that mud architecture is architecture for the very poor.